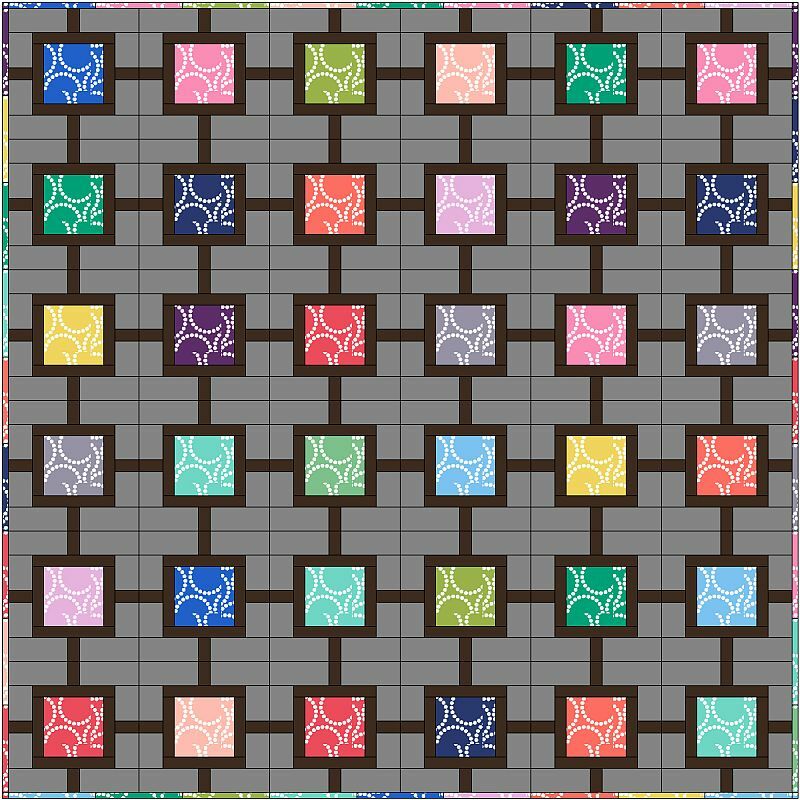 Ever since Lizzy House’s Pearl Bracelets line was released, I’ve been itching to make a quilt from it but I couldn’t think of what to do. Then I saw variations of this block popping up every where and thought it would be perfect for another quilt along! I’m calling my version String of Pearls. Of course, you don’t have to use Pearl Bracelets – any colorful set of fabrics will look fantastic! How about using solids, or scraps you’ve been hoarding saving? The key to the success of this design is in the contrast. Just make sure the bands around the “pearls” (center squares) really pop and that your background, or “negative space” really contrasts or recedes. String of Pearls Kits are available in 2 options: a complete kit including all of the fabrics for the quilt top, or a starter kit with the Pearl Bracelets fabric only. 12 chubby eighths of colorful prints – a chubby eighth measures approximately 9″ x 20″ or half of a fat quarter. You will need one extra 2.25″ x 20″ strip for a scrappy binding. 1.5 yards solid black – I am using Kona Pepper. 2.5 yards grey or neutral background – I am using Kona Medium Grey. 4 yards for backing (or lots of scraps and leftover pieces). Piece of batting that measures at least 70″ x 70″. Please note, this time around I will go two weeks in between each step. I’d like to give everyone plenty of time to work at their own pace. Be sure to share pictures of your progress on my flickr group: Christa’s Quilt Along. I can’t wait to get started! Grab my Quilt Along button! Love your quilt design. I finally finish mine. I use a bright yellow mustard color for my background it makes the colors pop. Also I used a lot of scraps. I entering it in our quilt show this year, the theme is color burst. I have FINALLY gotten all my fabric cut for this quilt and will be able to get it sewn together when I get home from vacation! (I took all the fabric with me so I could get it cut during slow evenings during vacation). Thanks Christa I loved making this quilt. Finally finished my String of Pearls Plus. Whew. Thanks for the QAL, Christa. It was fun. Posted my pieces to Flickr. I will blog about it later today or tomorrow. I collected fabric while traveling out west with my husband. Guess it will be a memory quilt. Can’t wait to start sewing the pieces. I received my package of Pearls from Christa’s so I’m ready to go. Will be cutting tomorrow. This will be my first quilt along! I have made 2 quilts so far, so I’m looking for some experience and company! Thanks for organizing! about crafts I get the eye rolling action or that’s a waste of money response. this, I would love to make a modern version of dresden plate. One without points. This one should be pretty easy and fun! I think I’m going to try to QAL. Not sure how to Flikr but I think I’ll figure it out by the end of the QAL. I love the colors in this quilt!! beautiful! i am so excited! love this quilt!! I like the 2 week intervals too!! Sure that would be great. Work on your quilt along with us! Looking forward to it! This will be my first quilt along! I am in, great pattern. I’d love to join this quilt along, but I have SOOOO much fabric in my stash that I want to start using up, would it be ok to use what I’ve got on hand rather than buying more fabric? I’m in. I love this pattern! Is the center (the pearl bracklet part) one piece or cut and pieced? It looks like a fun quilt! It will be one continuous piece. The picture came out like that due to the limitations of the design software, but each center square is cut 5 1/2″. Great summer project! Can’t start ’til I’m home from vacation, but it looks like a good one to work on a bit at a time. Fun new design, Christa. I finally got my updated Hugs and Kisses pic loaded to Flickr. Still need to sew the blocks together but I’m working on a birthday quilt at the moment. You know those deadlines 🙂 Hope your running is getting off to a good start! I’m trying to walk more. I have some pearl bracelet but need blue. 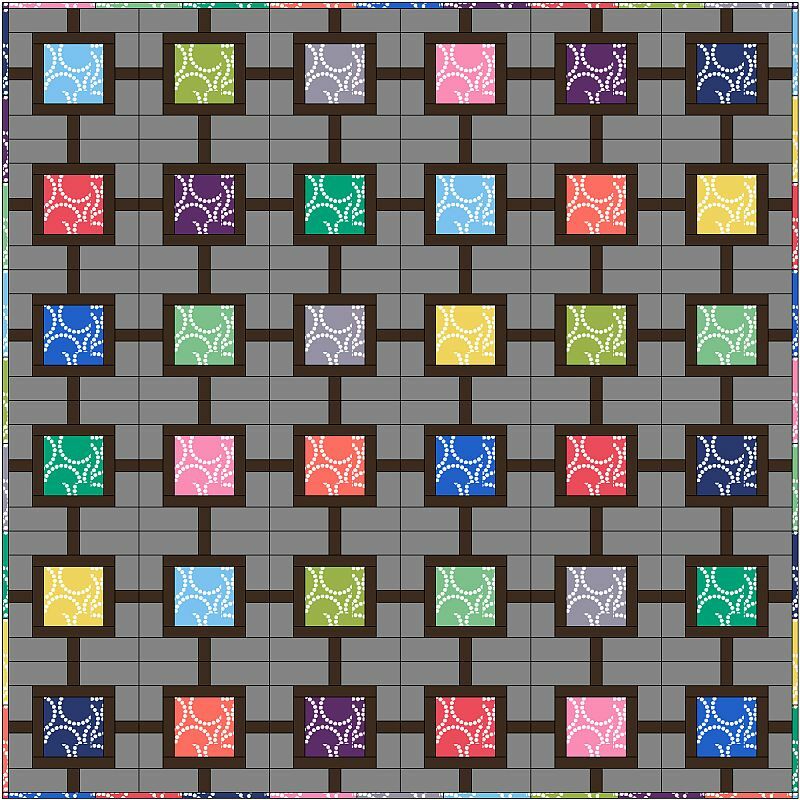 I am looking forward to this quilt!!! I’m excited. Can’t wait to get my fabric order and get started. This is my first ever ‘quilt along’, Yay!!! Oh wow! This is another pretty one, but I am still making Hugs and Kisses so may have to watch along from the sidelines!